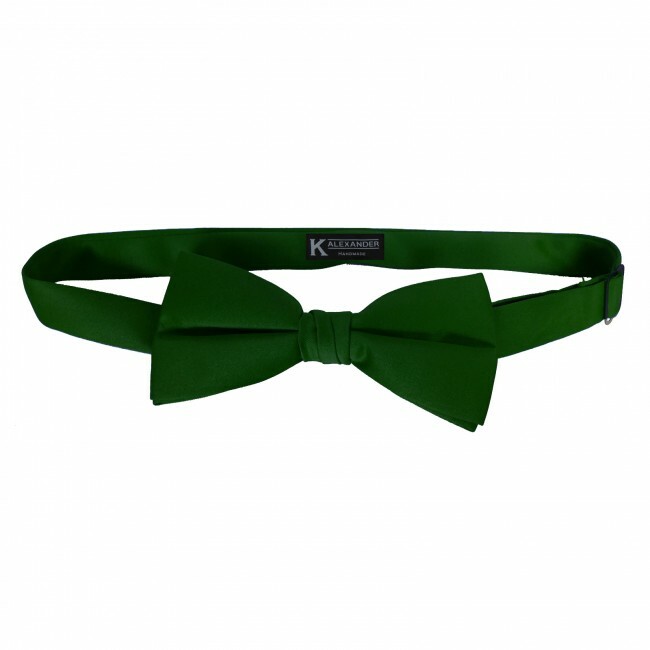 The K. Alexander solid hunter green bow ties are very popular to wear with tuxedos and are great for weddings, proms, schools, choirs, sports teams and individuals looking for a quality bow tie at a great price. This bow tie is pre-tied with an adjustable band. The bow is approximately 4.5 inches wide by 2.25 inches tall. The adjustable band fits necks from 10 to 21 inches which should fit most adult men. 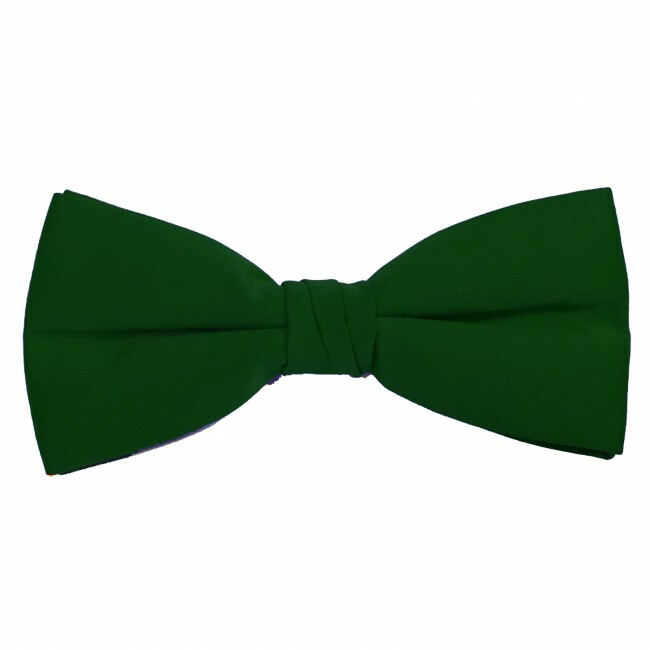 Hunter Green Bow ties are available in many different sizes, shapes and styles. This hunter green bow tie is a deep shade of green. Perfect for weddings. The material is satin finished with a medium amount of sheen, which means it does have some shine, which creates variation in the exact shade/brightness that is shown at any given moment, depending on the amount, type and angle of the light hitting the tie. If the exact shade of this bow tie is a concern, please read our color matching section to help. This hunter green bow tie is pre-tied with an adjustable band. This means you don't ever have to worry about tying it and it always looks perfect. It is not a clip-on that can easily fall off or be knocked crooked; this hunter green bow tie has an adjustable band that goes all the way around the collar and can adjust to fit necks from 10 to 21 inches. The bow of this hunter green tie is approximately 4.5 inches wide, by 2.25 inches tall, which is slightly slimmed down and considered the modern size bow. It is very a popular size bow and considered appropriate for most all occasions. The band on this bow tie adjusts to fit necks from 10 to 21 inches, which means it will fit most necks from little children to larger sized guys. That said, because of the slimmed size of the bow, this tie typically is most appropriate for guys age 12 and up. The bow would look quite large on guys any younger than that; for the youth crowd, we recommend one of our boys sized bow ties. Likewise, the modern size bow might be too slimmed for guys with a larger build.